The demand for luxury goods can be traced back to ancient Roman and Greek times. Luxury goods have evolved through the ages from scarce spices and foodstuffs to include items such as jewellery, watches, perfume and pens. The demand for personal luxury goods is rooted in the ‘feel good’ factor associated with owning such items. While the industry has its origins in small artisan family-owned businesses, the firms that have survived and thrived are those with strong brands that have captured the imaginations of affluent and aspirational consumers. One such company is Richemont, a global conglomerate that produces and sells luxury goods. It owns a stable of very powerful luxury personal brands that have successfully endured the highs and lows of business cycles over many years. Richemont’s brands include Cartier (170 years old) and Van Cleef & Arpels (121 years old). Richemont is one of the largest holdings in the Investec Equity Fund and has been a key contributor to performance year to date. The company went through a tough time over the last three years, but we realised that the earnings tide was turning for Richemont, and in January we initiated a position in the stock. Our investment philosophy is to invest in companies receiving positive earnings revisions and that are reasonably valued. Richemont has met our investment criteria of receiving positive earnings revisions, and we believe the company will enjoy further earnings upgrades. One of the key considerations in the outlook of a company’s earnings potential, is to understand the business cycle and demand drivers for a company’s goods, and how that business has positioned itself in the market it serves. The historic growth of global personal luxury expenditure has undoubtedly been strong over the last three economic cycles that have spanned 22 years. According to estimates by Bain1, the global personal luxury goods market reached a value of €251 billion in 2015. Since 1994, the industry has achieved a compound annual growth rate of 6.1%. Chinese consumers had accounted for less than 5% of luxury expenditure in the world in 2000. By 2015, Chinese consumers comprised 30% of luxury goods expenditure. Swiss watchmakers increased production and exports to meet the rise of Chinese luxury demand after the 2008 global financial crisis. But luxury sales growth began to slow in 2014, and it seemed that the long runway of new Chinese consumers entering the luxury market was starting to tail off. The result was that the market was left with an oversupply of Swiss watches. The industry faces a multi-year inventory destocking cycle to address excess supply, particularly in Hong Kong. The situation has had a material impact on Richemont’s operating profit from its specialist watchmaker division, as the company had to buy back watches from wholesale partners due to weaker demand. By the end of 2016, Richemont had been receiving three years of consistent negative revisions for its forecast earnings in its 2016, 2017 and 2018 financial years. The weakness of watch sales was a key driver of the group’s negative earnings revisions. While Richemont has gone through some tough times, we believe its prospects are improving, which is reflected in recent earnings upgrades. The macroeconomic environment has become more supportive for rising luxury spending. Consumer confidence recovered over the course of 2016. After the world digested the Brexit vote and Donald Trump’s election as US president, political uncertainty reduced. Equity markets, estimated to account for up to 70% of US household wealth, rallied into year-end, while Chinese consumer confidence was underpinned by supportive government policy of stabilised growth and a buoyant property market. Global tourism also made a recovery toward year-end. We did not have exposure to Richemont for a number of years. However, at the beginning of the year we took an active overweight position, as we forecast improving earnings expectations. The market had become overly bearish in the negative spiral of earnings revisions, thereby missing the changing economic environment, the improvement in consumer sentiment and potential jewellery sales. We were overweight Richemont by the time the first earnings upgrade had taken place, and we believe there is room for further positive revisions. 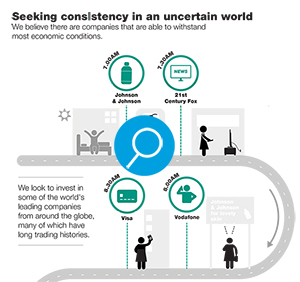 We believe there are companies that are able to withstand most economic conditions. Jewellery has become an increasingly important part of Richemont’s business. Jewellery sales now account for 39% of group revenue, up from 20% in 1999, as shown in Figure 1. Where watches were a key driver in the previous cycle’s recovery after the global financial crisis, our analysis shows that jewellery will be the driver of earnings revisions in this cycle. Most of Richemont’s jewellery business is housed within its Jewellery Maisons division, which comprises the Cartier and Van Cleef & Arpels brands. There are no clearly defined product boundaries as Cartier sells jewellery and watches, and there is some jewellery sold in other divisions, such as the watchmaking and jewellery. Despite the strong growth already achieved, the branded jewellery market is still in its infancy. Only 20% of jewellery sold today is estimated to be branded. This makes jewellery one of the most underpenetrated personal luxury products. With jewellery sales forecast to expand at a compound annual growth rate of 6% over the next five years, branded jewellery sales should exceed average market growth as the sector increases market share. The exclusivity factor in being a luxury brand is also an advantage to Richemont and creates high barriers to entry. It takes decades to build the aura of luxury and brand awareness, and once brand status is achieved, it allows for extraordinary pricing power. The potential for luxury brands to expand margins is far higher than that of retail brands. Beyond the attractive top line growth, the group has also delivered on operating profits. In the face of strong growth, the Jewellery Maisons division did not overstretch its store network to match its sales growth. While remaining disciplined and expanding the footprint at a compound annual growth rate of 1.5% from 2009 to 2017, there was a clear emphasis on keeping the distribution channel to majority in-house control over externalised store management. This helps to maintain control of brand image and it also provides better visibility to any changes in consumer behaviour. In addition, there is no ‘intermediary’ delaying the company’s ability to react to changing market conditions. Importantly, jewellery has grown to offset any weakness that the Cartier and Van Cleef & Arpels brands may have experienced in respect of watches. Investors became overly negative about the prospects for the luxury goods sector and investor sentiment had also turned bearish towards Richemont. We recognised that the macroeconomic environment had become more favourable for luxury goods producers. We saw this as a rare opportunity to buy a good quality business at an attractive valuation where we expect earnings forecasts to be revised higher. While Richemont’s specialist watch division is taking strain, our analysis shows that the jewellery division will remain a key driver of earnings revisions and we believe there is room for further positive revisions. We believe Richemont’s position in the jewellery market is superior to competitors. In our view, the market is underestimating the operating profits that Richemont’s Jewellery Maisons division can deliver in the coming cycle. While jewellery goes from strength to strength, the specialist watches division has experienced its trough margin year. Although we do not expect a strong performance from the division over the next three years, as the industry faces a major repair process, there is plenty potential for improvement. 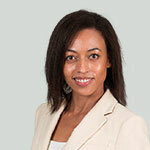 Samantha Hartard is a portfolio manager in our SA Equity & Multi-Asset team, which manages our Investec Equity Fund and Investec Balanced strategy. Most of Richemont’s jewellery business is housed within its Jewellery Maisons division, which comprises the Cartier and Van Cleef & Arpels brands. There are no clearly defined product boundaries as Cartier sells jewellery and watches, and there is some jewellery sold in other divisions, such as the watchmaking and jewellery house, Piaget. Jewellery is structurally a more attractive market than specialist watchmakers, and Richemont has already achieved great success in the market, as illustrated in Figure 2. Between Cartier and Van Cleef & Arpels, Richemont is the largest publicly listed luxury branded jewellery company in the market. All information provided is product related, and is not intended to address the circumstances of any particular individual or entity. We are not acting and do not purport to act in any way as an advisor or in a fiduciary capacity. No one should act upon such information without appropriate professional advice after a thorough examination of a particular situation. This is not a recommendation to buy, sell or hold any particular security. Collective investment scheme funds are generally medium to long-term investments and the manager, Investec Fund Managers SA (RF) (Pty) Ltd, gives no guarantee with respect to the capital or the return of the fund. Past performance is not necessarily a guide to future performance. The value of participatory interests (units) may go down as well as up. Funds are traded at ruling prices and can engage in borrowing, up to 10% of fund net asset value to bridge insufficient liquidity, and scrip lending. A schedule of charges, fees and advisor fees is available on request from the Manager which is registered under the Collective Investment Schemes Control Act. Additional advisor fees may be paid and if so, are subject to the relevant FAIS disclosure requirements. Performance shown is that of the fund and individual investor performance may differ as a result of initial fees, actual investment date, date of any subsequent reinvestment and any dividend withholding tax. There are different fee classes of units on the fund and the information presented is for the most expensive class. Fluctuations or movements in exchange rates may cause the value of underlying international investments to go up or down. Where the fund invests in the units of foreign collective investment schemes, these may levy additional charges which are included in the relevant Total Expense Ratio (TER). A higher TER does not necessarily imply a poor return, nor does a low TER imply a good return. The ratio does not include transaction costs. The current TER cannot be regarded as an indication of the future TERs. Additional information on the funds may be obtained, free of charge, at www.investecassetmanagement.com. The Manager, PO Box 1655, Cape Town, 8000, Tel: 0860 500 100. The scheme trustee is FirstRand Bank Limited, PO Box 7713, Johannesburg, 2000, Tel: (011) 282 1808. The full details and basis of the award, affirmed on 25.01.17, are available on request. Investec Asset Management (Pty) Ltd (“Investec”) is an authorised financial services provider and a member of the Association for Savings and Investment SA (ASISA). Issued by Investec Asset Management, July 2017.